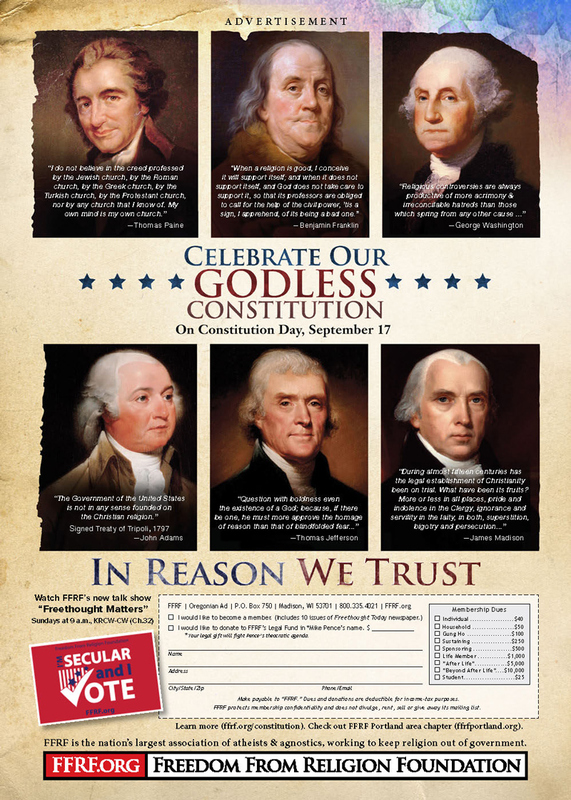 The national Freedom From Religion Foundation and its Portland chapter are placing a full-page advertisement in the Sunday Portland Oregonian celebrating “Our godless Constitution” and Constitution Day. Monday, Sept. 17, is the 231st anniversary of the adoption of the U.S. Constitution. Adds Annie Laurie Gaylor, FFRF co-president: “The United States was first among nations to separate religion from government, to adopt a godless Constitution which places sovereignty not in a deity, but in ‘We, the People.’ However, the Religious Right continues to repeat the Big Lie that the U.S. is a ‘Christian nation.’” Nothing could be further from the intent of our Founders, she says. That’s why, FFRF notes, the Constitution’s only references to religion are exclusionary, such as that there shall be no religious test for public office. The freethought association, with 32,000 nonreligious members — including more than 900 in Oregon — also works as a state/church watchdog.